Why? – My Husband Drives A Lemon! And even the kitchen sink! 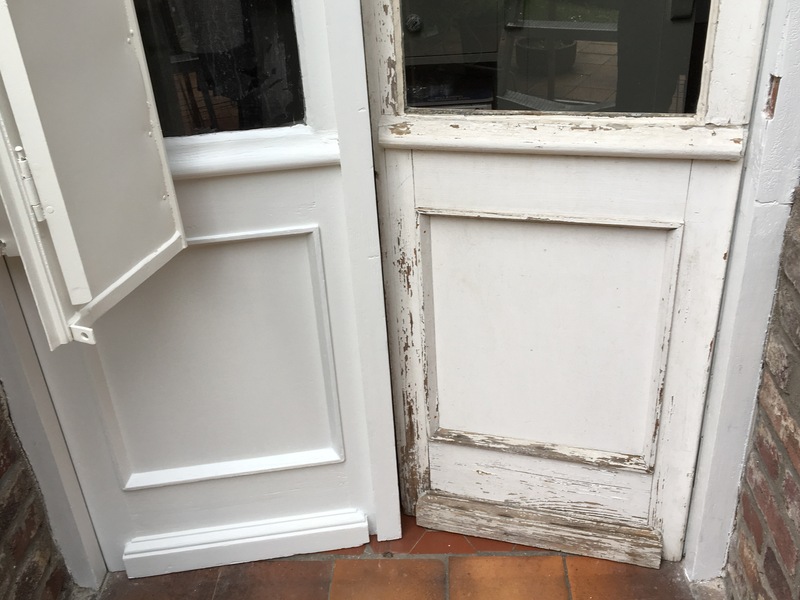 I’ve decided, quite excitingly ( for me anyway) to give my blog a face-lift, and so next time I post you may find a few changes to the layout and header, but for today I’m going to tell you about the much needed face- lift for our very neglected kitchen! Anyone that’s rented in France will know that the ‘oh so’ well known english expression, “taking everything but the kitchen sink” is not a figurative expression here when it comes to house moving, but a very big reality. It’s very common to arrive at a new rental or purchase property to find that in the kitchen there is only one item- quite literally a sink, often without even a cabinet below it. It was almost the case when we first moved into our house. The elderly Monsieur from whom we’d bought it had gaily lived his life using the top of his mini fridge as his work top, with a small wooden table in the centre of the room. The sink, on a very dilapidated cabinet in the corner was built for a very diminutive person, and washing up bent double to achieve the right height was not a pleasant experience. For three years we nevertheless continued with his tradition. I made a very half hearted attempt to paint the cupboard. It wasn’t strictly necessary to struggle on, but ‘husband a l’étranger ‘, as he was at the time , and I had come to an impasse over what would be the replacement sink. Husband ‘a l’étranger’ was very fond of the old battered ceramic sink, complete with chips, yellowing and scratches, and I was all for a modern but similar replacement. Gradually he begun to comment about the presence of some interminable flies which seem to appear from nowhere just after he had cleared the last lot through the door. For my part, I was anxious about the damp under the sink which turned out dishwasher salt into a nasty clump, and let’s not even mention the wet patch in the cellar which had convinced me that we had an major underground drain leak. At the same time as we bought our island unit to give us a decent worktop, I bought a matching base unit for a future sink. I also searched around for quite some time, looking for a new ceramic sink. It took a lot of finding as I wanted 2 bowls, and Husband ‘a l’étranger ‘ wanted an integral draining board. It had to be as near to a metre long to fit into the space I calculated would be available after the base cupboard was modified. Eventually, at great cost I found one.When it arrived on the truck it took 2 strong men to lift it, and it was put in the corner of the dining room…where it stayed for nearly for two years! Husband ‘a l’étranger ‘ cocked a snook at the lovely new white ceramic sink declaring that my idea of converting the base unit cupboard, which was designed for a single Belfast sink, into a double Belfast sink was nigh on impossible. He went to Emmaus and bought a competing sink for 15 € in a style circa 1970, which would involve, yes you guessed it, modifying the base unit as his was a “sit- on”, rather than a “sit-in” style. The stand off lasted longer than I bear to think about, but approximately two years! Half the trouble was that ripping out a kitchen sink completely handicaps the functioning of a kitchen and there wasn’t quite enough impetus to make it happen. At some point into the second year I disappeared into the garage, and only came back inside once the base unit had been completely painted, – except for the area which needed to be modified and cut away. Husband ‘a l’étranger went into the garage and balanced his sit-on sink on top of the base unit, and gradually the whole turned into a new dumping ground for various bike helmets, tools and ‘odds and sods’! And so the stand-off continued. And then, in November, the mighty ‘hand of god’ intervened with his ‘acte de dieu’ and our dishwasher spontaneously went up in flames at five o’clock in the morning. And there’s nothing like being forced to wash up for a family of six at a very low sink to focus the mind. The following Sunday, Husband ‘a l’étranger’ rose from his seat in the sitting room and disappeared into the garage and suddenly the sound of a saw could be heard. Within a couple of hours the offending piece of base unit was removed and a double sink size space was created in its place. The following day the cupboard and sink from the kitchen saw their last. And from that moment we haven’t looked back! A support was made for the new heavy sink: You can see how we cut away the right-hand drawer to increase the space for the sink. The biggest detail issue was how to close of the space between the sides of the sink and the base unit, which we did with a thin piece of timber panel, slightly recessed and painted the same colour. We closed of the left hand end of the freestanding base unit with the wall with another piece of recessed painted panel, placed the new dishwasher in its position with a temporary door and laid on the oak worktop. The next issue was how to deal with the small spaces either side of the cooker. Matching the feet of the freestanding unit we made a faux left-hand panel and a fixed right hand panel. The centre part of the left hand side panel opens with a narrow pull-out bottle drawer. On-line I had discovered a company who made paneled dishwasher doors in a shaker-style. Their excellent design with identical feet to our kitchen units would have been ideal but unfortunately theirs was designed for a higher worktop and an XXL dishwasher. Neither of which we had. Husband ‘a l’étranger’ thought I was more than a little mad (and rather demanding) when I suggested copying the design and making it ourselves. The idea was to make the dishwasher door resemble a free-standing unit, and therefore a door within a frame. However the door and frame are actually just a door! Here it is with the leg part of the frame cut off, fixed to the dishwasher and with painting just underway. And here it is fully painted with the legs in place. If you look carefully you can see the horizontal cut across the legs which is where the dishwasher door opens at its hinges. Without the cut the dishwasher would never open! The full width of the dishwasher door runs from washing machine on the right to sink unit on the left, but yet it looks like a freestanding unit in itself. I think you’ll agree it’s a great design, (and build), neither of which I can take credit for. ….and the flies, well they had made their nice home in the old overflow pipe of the old sink, and the old waste pipe had been silently dripping for years into the sink cupboard and down to the cellar below. Now both issues are something of the past. ….and that’s got to be a first! Our bathroom is one of those horrors you hope never to come across, even after years in the wilderness, yet it has taunted us for three long years since moving into the house. In an attempt to protect the most sensitive amongst you, I spent a while cleaning before taking the photos, but even one of my dear friends conceded, after putting her back into the task that the bath was uncleanable and perhaps should be painted just to tide us over( excuse the pun)! As you can see we have an interesting blocked-up window, rather outrageous pink tiles, and a glaringly pink cupboard..
..notwithstanding the terrible peeling paint issue.. and let’s not mention the dirty bath again! The plumber told me that the silicone sealant should be redone every year, but if you knew about the water that insisted on finding it’s way between the bath and the wall, and positively wrecking the sitting room ceiling below, you’ll know why, now that we’ve managed to waterproof the joint, we have no intention of picking it all out and starting over again. But when you only have one bathroom to share amongst six people, with four of them being adolescents, ripping it out the entire bathroom has simply never been an option. Off the master-bedroom, however, was a tiny “coin lavabo” (basin corner), and just behind it, opening onto the landing was a large-ish cupboard, and though storage is very crucial, we decided to move the partition wall to create a larger space for a “coin douche” ( shower room) and a smaller cupboard instead. This decision was made a year and a half ago, so you will be forgiven for thinking that we’ve made heavy weather of it. What’s held us back has been an annoying detail called ‘jobs’ and the need to seriously waterproof the space as directly below is our hallway. Living in Normandy we had no great desire to come inside from one shower straight into another one coming through the ceiling! The first part of the construction process saw us full of enthusiasm. After all there is nothing more satisfying than knocking down walls! The next process, buying the products, was equally satisfying, but that’s when work pressures got too intense and the project ground down. This summer with the prospect of using the bathroom becoming less and less appealing, I finally, and uncharacteristically turned to the professionals! The first plumber who came to quote arrived in his shiny polished pointed shoes and impeccable suit. He enthusiastically declared anything was possible. His quote was so much lower than the others our confidence ebbed as his increased. The second frowned for several minutes and then appeared reassuringly knowledgeable, batting away our more crazy ideas and coming up far more realistic alternatives. But on his way out declared that he couldn’t ‘insure’ leaks from the products we had already bought. The third, jovial and encouraging plumber came up with an excellent idea to remove the necessity for a ‘trap-door’ to get to hidden piping by turning the entire shower through 90 degrees and having the pipe work accessible from the reduced sized landing cupboard. He was our first choice but he never sent us a quote. In the end plumber number two was available with a space in his calendar to construct our shower the first week of September. He did a beautiful job, happily turning the shower through 90 degrees without argument, and left several days later having even tiled the rest of the shower-room floor which I’m sure we hadn’t even asked him to do in the first place! So why, you might ask, am I only telling you about it now, at the end of November? It turns out, you see, that turning a shower tray through 90 degrees is not a very good idea. Now the slope of the shower to the drain is exactly where we need to put our shower screen. And I defy you to find me a shower screen manufacturer who makes shower screens that slope by 28mm from left to right along their bottom edge! There’s a Do it Yourself store in France called Leroy Merlin, it’s a bit of a play on words actually. When pronounced correctly it really says Le Roi Merlin, ( king Merlin) and old Merlin was allegedly a bit of a magical chap. So this seemed the ideal place to find a shower screen solution. I fell upon a very nice assistant at Leroy Merlin, let’s call her ‘Madame’, because that’s what she also calls me. My initial conversation with all the bathroom staff, and believe me, shop staff in places like this really are pretty knowledgeable, if occasionally a bit rigid in their viewpoints, involved a lot of sucking teeth. They had a made ‘sur mesure’ service but their computer programme was only set up to register modifications of glass sizes to the sides and the top of the shower screens. Definitely not to the bottoms! To complicate matters the fabricators were based in Germany, but at least on the same time zone, although some of the delays to respond might have had us thinking otherwise! However Madame asked me to go home and measure millimeter by millimeter the fall across my shower tray. 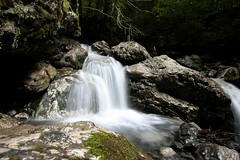 After that she seemed to decide that she was going to resolve the conundrum by hell or high water. The only trouble is that Madame is only available on a Friday. It seems that Madame and I are more switched on than the German company, as we kept getting back quotes for shower screens with doors that had to open against the slope. As much as I might wish it, i cannot squeeze my body through a 2cm gap once the door grinds to a halt against the slope of the shower tray, no matter how much I wish otherwise. Madame and I have been sending each other many encouraging emails – once a week! On Friday she was just emailing me when I physically entered the store. In the excitement at the latest development we entirely forgot to shake hands and greet each other before getting down to business. She realized about 5 minutes into the conversation, and stopped, a little shocked by her lack of manners ( and presumably mine as well), paused, and vigorously shook my hand with a “bonjour Madame” before resuming the partially completed sentence of moments before. It appears we might be nearly there. The German contact has realised that the hinges have to go on the lower side of the door. Madame has advised me that it would be worth measuring everything again as a final check because once it finally does arrive there’s no recourse for errors. But while we are waiting, we can at least admire the handiwork, and use the basin, carefully constructed and installed by ‘husband a la maison’ which has no awkward slopes except for where they’re meant to be. The marble to support the basin was found in our attic, broken in two and we glued it back together. 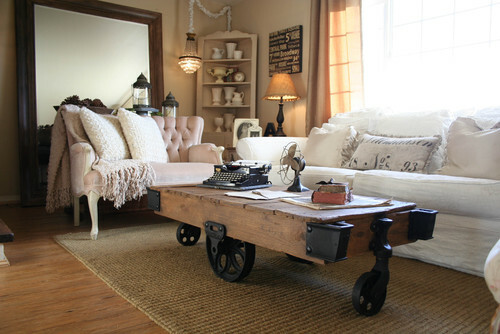 The little basin table was found in a brocante and modified to incorporate the basin itself. Not only that, but I am very excited to present the long searched for mirror. ‘Husband a la maison’ picked it up for 20€ at Emauus, which he is especially pleased about since I gave him the “do you really need to go there again speech ” a few minutes before he departed. And as if to add the cherry to the cake, it even has birds carved onto it which mirrors my curtains perfectly! Now all that there is left to do is to decide which lights to use above the sink – but perhaps you can help us with that! If we are all really lucky I may have a shower before Christmas! I’m sorry if there’s been rather a long silence on the blog, we’re just getting back on our feet after a house-fire. I really can’t believe I am writing those words as now the event simply seems astonishing and quite unbelievable, and every so often I think I imagined it – until I go into the kitchen that is, and see the large space where the dishwasher used to be. We were very lucky, and all the more conscious now of how important fire alarms and extinguishers are, as they made an exceptional difference to the eventual outcome. We all got out of the house unscathed, my husband was bravery itself mastering the flames by the time the firemen came, and we still have not only a house, but a kitchen that is once again operational. But if you don’t have fire extinguishers, go and get some now – yes, really, now! I’ll wait till you get back! As you can imagine, the manufacturer of the dish-washer will be getting a stern letter asking why our dishwasher would choose to spontaneously combust at five o’clock in the morning. But I want to transport you back in time to the endless days of summer, when the sky is blue with the occasional cloud scudding across it. 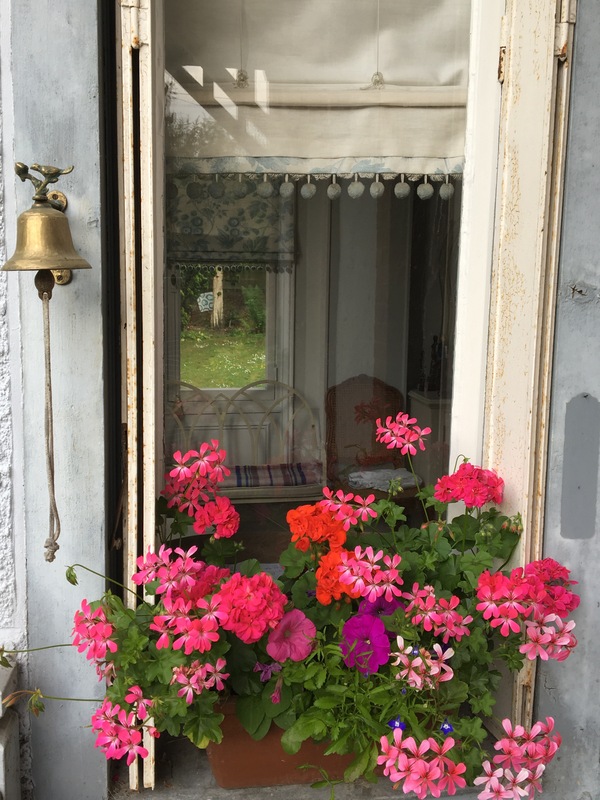 And I want to dedicate this post to my sister, who finally lost her brave battle with cancer just when the early summer flowers were coming into bloom. My sister adored gardens, and was my choice person to join me to visit ones of renown, to discuss garden design, planning and our favorite scented flowers. We’d planned that she would come and recuperate in the hammock under our cherry tree, giving instructions on what next to prune or plant, interspersed with essential cups of tea and cake. “Everything can be resolved with a cup of tea and cake” she said, though in the case of my garden we would probably need an awful lot of it. Sometimes you need a visit to a beautiful garden to restore inspiration and energy and we’d had the plan that we’d visit several french gardens during her convalescence. The Jardin d’Angelique is one such place we intended to go. I was surprised to find that the Jardins d’Angelique weren’t the opulent gardens of a vast chateau, but the rather more lowly “maison de maître”, or master’s house. The grounds were divided up into three unequal parts, a large lawn in front of the house edged with flower borders and a long high hedge, through which I found a long and intriguing organically laid out woodland garden, and finally, behind the house, a manicured formal garden. The archway in the hedge beckoned me to explore the woodland garden first, and after only a few moments I found myself in a shady clearing with a convenient bench, and mossy stone sculptures peering out from under glorious rose bushes and unusual hydrangeas. A few sinuous paths later, a sunny clearing, also with its bench, and the plants meticulously identified with little wooden labels. As I walked on, it was clear that this garden was one for reflection and peaceful isolation away from the hustle and bustle of the house itself. Here and there a pond, or stream: a bee”hive” or an Arbour: and finally, around another corner, an elderly lady with silvery hair, sécateurs in hand pruning à rather lovely ancient white rambling rose. She turned out to be the owner of the gardens, and I asked her if she had a grand plan when she first started creating the garden. “Oh no!” She exclaimed, and went in to tell me that the woodland garden had grown organically, stage by stage as she had sought to distract herself after the tragic death of her young daughter Angelique. Each time she created a new area she placed a bench to sit on, or an arbor to sit under out of the hot sun while she rested from her travails and took comfort in her flowers and reflected on the impact of losing her daughter. We went on to chat about natural remedies for common garden pests and diseases, before she took up her secateurs once more, and I went on my way to discover the formal garden and it’s topiary. I love formal gardens, and box hedging restraining willful, abundant and blousy blooms. The pond, with its lions as guardians was a lovely focal point. I spent some very happy moments enjoying the contrasts between ordered and racy plants. But there was something that drew me across the garden, that no other part was capable of. There in the garden was a tree, not like those in the woodland garden clothed in foliage, but completely bare of leaves. The tree was completely dead, just it’s silvery bark reaching up into the beautiful blue sky. And where the leaves should have been were oblong wooden paddles, hanging, tied by wire to its branches. First one way, and then the other. Endlessly turning in the light breeze. And on each paddle, in both french and english, a word. I sat under the tree for some while just watching them spin, reflecting, and then headed for home. And later I discovered that quite by chance my camera had taken its photo of the tree under “burst” mode, and so when I looked again at the picture, for a few brief seconds the paddles were spinning – and continue to do so today. Amongst all those photos of the garden captured in stills, the tree seems now to be the most living of them all. We’ve been doing a bit of work on the house again, and this time the shower-room is taking shape. There just the physical water connection, a shower screen and a mirror left to do, and when it comes to mirrors, there’s nothing better than trying to pick up an antique one, especially when the antiques faire at Chatou is on. We’d never been to this particular fair before and so didn’t know what to expect. The brocante is laid out on a small island in the middle of the river Seine, just outside of Paris. It was mid-week so not too many people were there, but it was huge and fabulous, and there were plenty of makeshift restaurants to choose from in the middle of the day. What I liked best was the artistry of some of the stands, and there was plenty that I would have loved to buy, though the mirror remained elusive! There were so many amazing urns and cloches, but our bartering didn’t manage to get us any bargains! I so nearly went for the pineapple, but “husband chez nous” didn’t look away for long enough.. it was after all “mission mirror”! I loved this one, a grey and gilt trumeau mirror….the price was to die for too! And after all, why have one when you can have three! So many lovely things that it was hard to head home. But since the great mirror hunt continues, there’s still the excuse to come back for more. The basin is very lonely all by itself. Giverny- on the bucket list. I met an 82 year old woman yesterday who has travelled to France from Australia to visit Giverny, the home of Claude Monet. “I studied fine art as a student” she explained to me, ” and that’s when I fell in love with Monet’s paintings.” When she graduated, she married and settled in England and her greatest wish was to visit Monet’s famous gardens. 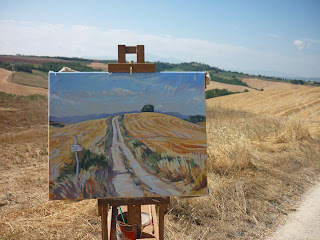 Her husband didn’t support her love of art, declaring. .
“Why would you travel to another country just to visit a garden? Now at the age of 82, divorced, with difficulty walking after an accident, and despite living in Australia, this lovely lady had thrown caution to the wind and flown across the world to make her dream come true. “I knew if I didn’t do it this year, I never would” she said, and I am happy in the knowledge that today she will have a fabulous day. We might have arrived at 8 in the morning, but Monet got his first view of his future home at Giverny in the early afternoon. He’d left his rented house in Poissy, the creditors at his heels, declaring he would not return until he found a new house for the family to live in. Imagine passing in front of this great house, and spying from the road an orchard in full spring blossom where the flowers are today, while the pretty nasturtium lined central allée was originally a dark and brooding yew lined pathway. Monet detested the way the trees blocked the light while Alice, his wife, felt that it was a crime to fell a tree. Persuading her to let him remove the lower branches, Monet subsequently lopped the tops much to Alice’s indignation. The denuded trunks soon became the supports for his climbing roses, until rotting away they were replaced by the metal arches we see today. As the seasons change, so does the garden. Irises and peonies are replaced by poppies and roses, and later by phlox, cosmos and dahlias. The abundance of flowers is overwhelming, even on rainy days one thinks the sun is shining, such is the colour and cheerfulness of the surroundings. Monet had ten gardeners once he had fully developed the gardens; today there are only 6, and an army of volunteers who classify the deadheading of the flowers “a gros boulot” , a big job! Pissarro’s wife once commented favorably on one of Monet’s irises and Monet subsequently dispatched a cutting of them to her on the next train! At the age of 50, 7 years after moving into the house, Monet started to create the water garden. Today there is only one gardener allocated to tend to it, and much of it is done by boat. Most of his activity is tending to the water lilies which are a great delicacy for the Muskrat. He has to ensure that the lilies grow in nice circular rafts, just as Monet liked them. After Monet’s death the garden fell into disrepair and had to be largely recreated. Alice had insisted that he write to her everyday when he was away painting. 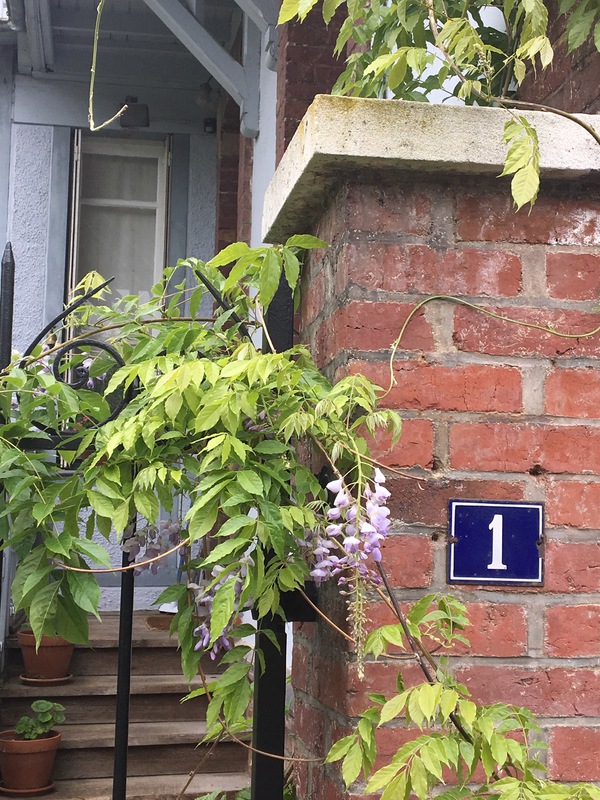 From his letters, his gardening instructions gave the restoration team a good idea of the type and position of the original flowers, and other little notebooks and seed order books held the rest of the clues. Today the garden is a masterpiece. A living work of art, just as Monet wanted; his largest canvass. “Gardening was something I learnt from my youth when I was unhappy, I perhaps owe becoming a painter to flowers” said Monet. Not surprising then that the lovely 82 year old I met yesterday was so keen to go and visit it. I truly hope it is everything she hoped it would be – and more! One of the problems when you live in a popular tourist destination is justifying leaving it to go on holiday. When thousands of visitors come annually to Normandy, the land of fresh cream and butter, of potent cider and endless coastline and lush greenery, it seems a bit strange to pay good money to go somewhere else. That was my dilemma when my annual holiday date approached, and firstly I spent a good week visiting several wonderful Normandy gardens, which will be featured in my upcoming posts until finally I decided that an entirely different scenery would be uplifting and inspiring. The only question was where to go! 25 years ago we drove as far as Cognac in the Charente region of France in a blue 2CV and I wanted to explore this region again with its fabled 2,400 hours of annual sunshine. I remember back then in my rather more youthful days that I had put my toes in the ocean and it was actually warm, quite a contrast to the chilly waters of my native England. So would the region live up to my expectations and inspire me too? Our little corner of Charente for the week was neatly placed between the wonderful creeks of the river Seudre, and the sandy beaches of the Cote Sauvage. (Wild coast). The creeks at low tide were wonderful for all their gloopy muddiness, the wildness of the marshes, known as the Marais, the colourful oystersheds and wooden jetties radiating with the beating sun. This is oyster territory and we made a mental note to return to sample some in the evening. We were sure the abandoned boats and closed up sheds would be back in use once the tide came in, but for now we enjoyed the landscape and the evident bird life in the marshes, out of reach of land bound humans! We decided to head where we knew there would be water, the sandy beaches of the Atlantic coast were calling, and were entranced by the different landscapes a mere 15km apart. Beautiful forest obscured our approach… ..before we climbed to the crest of the dune.. and suddenly the the sea sprung into view, and what a beach, pristine sand, huge crashing waves and clear blue water. And it was oh so difficult to leave! But in the end the little creekside restaurants were calling, and we just had to try the oysters and Eclade de Moules which we had spotted earlier in the day. Installing ourselves at a table on a wooden jetty over the creek we watched the chef painstakingly stand the raw mussels on a wooden tray. Covering the mussels with a huge pile of pine needles from the abundant coastal pine forests, he struck a match while we tucked into our prawns and oysters. Then sizzlingly hot, the freshly cooked mussels arrived at our table tasting of woodsmoke and the sea. And finally replete, with the growing darkness all around us, we headed home, but not without a backwards glance, and thoughts that we could do it all over again tomorrow! One of the things I love most about my house are it’s shutters. 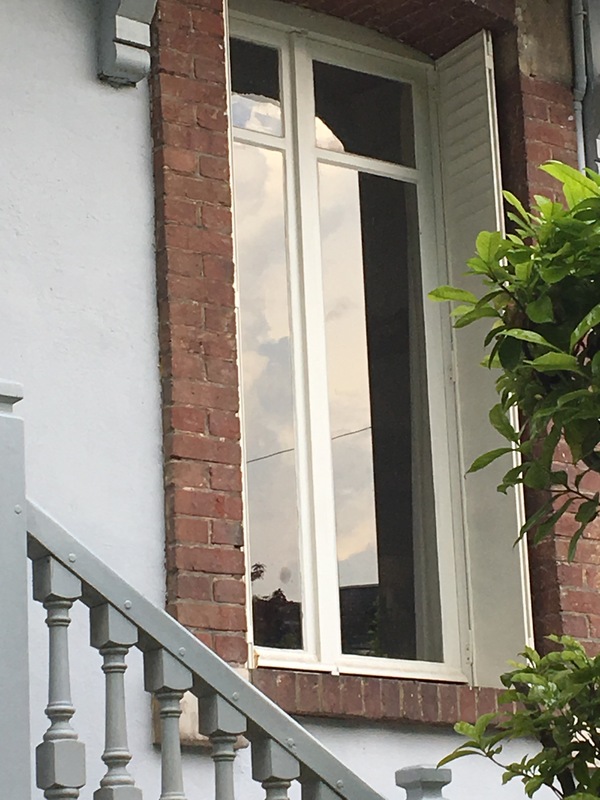 We use our shutters often, to keep out the heat of the summer’s day, to trap the cool in the house and let a gentle flow of air pass through the louvres , or to batten down the hatches against the noisy winter storms. Last summer we started on the onerous task of painting the windows of our house. The windows are a century old, the paint is almost non-existant, peeling from decades of strong sunlight. But the windows are in deep reveals protecting them from the vagiaries of the weather and the wood is in good condition. The windows that we finished last summer looked wonderful in their new coat of paint, but sadly the shutters were left lacking. 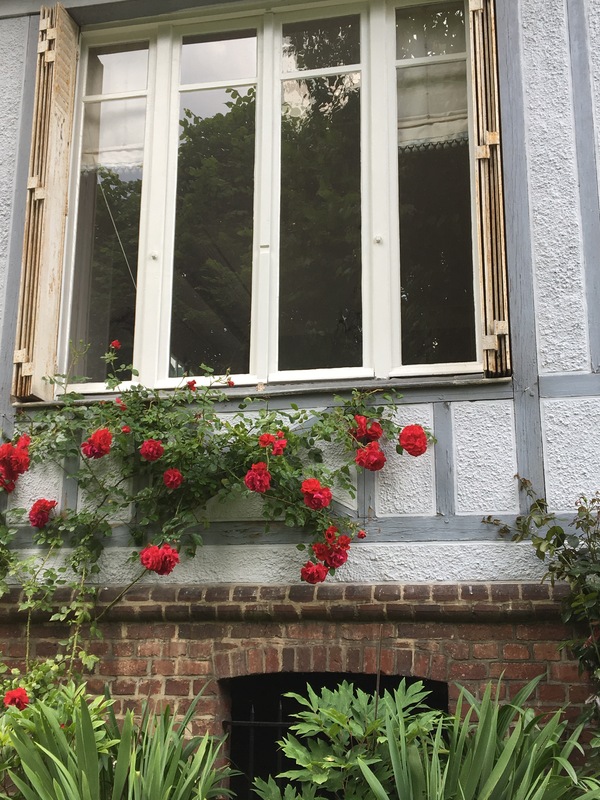 Last summer we also attempted to renovate a pair of shutters, but we knew almost immediately that we would never manage the deep louvred openings and so started looking for someone who had the equipment necessary to do a good job. One of the things that makes France such a wonderful place to live is the presence of small enterprises which are capable of undertaking craftmens jobs with skill in abundance. We found a four man team who could sandblast and hot-seal spray paint the shutters, and with whom the whole business was undertaken with jovial good humour, a fair amount of negotiating on price, and an analysis of what team we would support if France, Scotland and England were up against each other in a rugby final. Yesterday we collected our first two pairs of shutters. 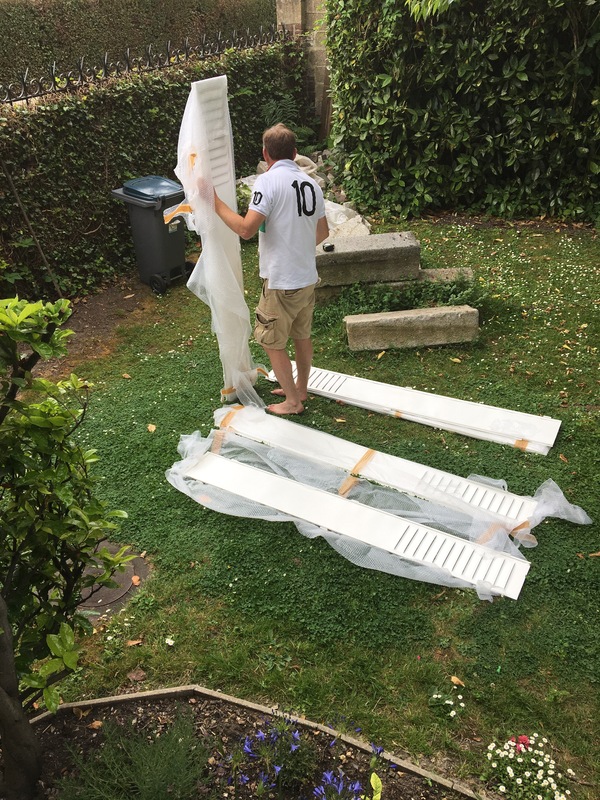 “Husband à la maison”, in a moment of extreme enlightenment and wisdom, had recommended we only sent two pairs of our twelve pairs of shutters to be renovated at a time. Each pair of shutters has at least two panels and up to six. 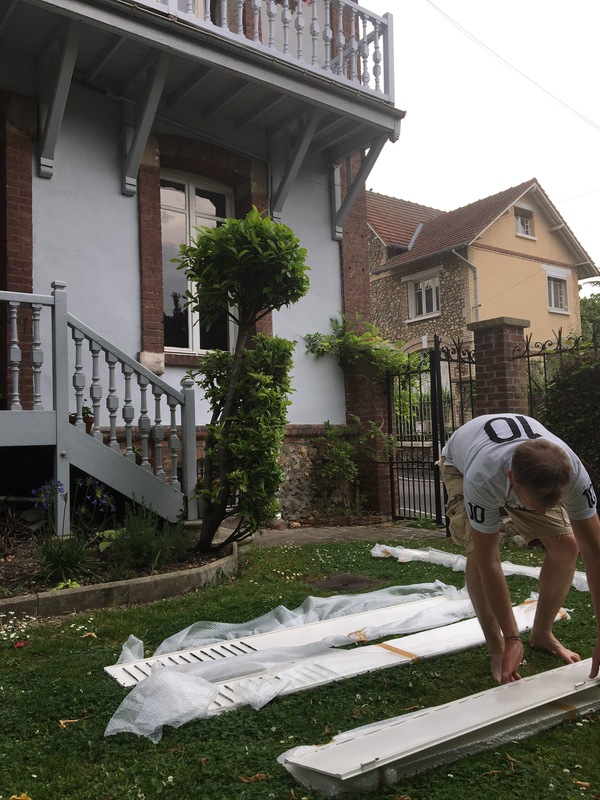 When our two pairs of shutters were returned, we lay them on the grass and set to, with much scratching of heads and a tape measure to try to pair them up again. With each matched shutter the process became more and more simple as the possible matching options reduced. Hanging them up again was another question entirely. It’s a lesson in motivation, for no sooner are the painted shutters rehung, than the unpainted windows behind them need to be renovated. In France, if you leave your house unoccupied for more than two weeks you are obliged to close up the shutters or risk violating your house insurance. In reality most people close their shutters even if they are only absent for a weekend. For us it’s a race to the finish or we may have to stay at home all summer until we’ve completed them. In which I ditched my husband in favour of a Frenchman! A French Dinner and a Twice Baked Goats Cheese Soufflé. Ou Se Trouve Le Canard Perdu? Le Canard Rouennais, or Rouen Duck. Big Jobs Hanging Over Our Heads. Tarte aux Pommes -Celebrating Autumn! La Fête de Ventre – The Celebration of the Stomach! Continuing the Renovations -Attacking the Bedroom! Making Sense of it All – It’s All in the Translation! An Afternoon à la Campagne. Tarte aux Fruits and a 19th Birthday! Everything but the kitchen sink! Passe-moi le Fromage! Irreconcilable differences. Junk Shop “Finds” – And Restoring a Table. The Rentrée Brings With It The Tang Of Autumn. Universities and Prepas for the Uninitiated! All aboard for Patisserie Classes – A little matter of Translation! Making an Entrance – Transforming on a Shoe-String! The Shady Side of the Law: In Which I Manage to Report Myself to the Fraud Squad! In 2009 I moved to the city of Rouen in France with my husband and four children. My passions are art and architecture, food and cookery, and markets and brocantes. More by experience than choice I am becoming quite an expert of French schooling! When not extricating myself from some precarious scenario in ropey French, I pass my time as a English speaking tour guide for the Bureau de Tourisme; at a cookery school run by professional patisserie chefs; trawling local brocantes or photographing beautiful places I pass through. Last year I enrolled at Rouen University where I am did a 'Diplôme' in the French language whilst juggling the timetables of my busy children. Having climbed the mountain of integration I have immersed myself headlong into French culture which never fails to be an exciting ride!